First up: decking material. There are many fine, low-maintenance decking options from which to choose, including vinyl, treated wood or aluminum. The final effect depends on your budget and personal desires, so speak to a decking expert before making the final call. Note: If you want a firepit on your deck, make sure you choose a nonflammable decking material such as aluminum and put down a large, fireproof grill mat. The same goes for your barbecue, which you can absolutely have in your outdoor living space as long as you prepare for potential flames and cinders. There are a huge number of deck styles from which to choose. The first step here is to take weather into consideration. If you live somewhere rainy, then it’s smart to design your deck to work even during drizzles (or downpours). That means putting up thick canvas to make a tent on part of the deck, right near the door. That way, you can still enjoy those cozy fires and thick blankets, even when Mother Nature is having a tantrum. Laid-back Bohemian vibes with bright pillows, hanging lanterns, tapestries and perhaps even a Persian rug underneath an overhang. Just be sure to roll that rug up, as well as any other non-waterproof furnishings, before the rains come. Luxurious African safari furnishings, with hanging mosquito netting, neutral furniture and steamer trunks to serve as tables. Complete the look with wooden carvings of animals, wicker mats and old-school glassware for your cocktails and mocktails. Beach chic, with tropical prints, turquoise pillows and wind chimes, complete with a conch or two (or ten). Make sure to throw out some Hawaiian-print towels for pool or hot tub dipping, if that’s an option! 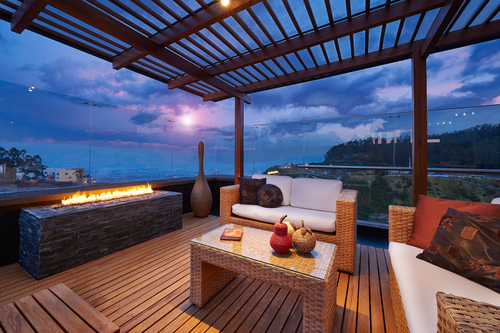 Of course, your deck only becomes a rocking outdoor living space once you add in all the little comforts of life. In addition to pillows and blankets, make sure you have glassware accessible, along with small plates for tapas and reusable cloth napkins that match the décor (environment first!). Now that you’ve got some ideas for your outdoor living space, what are you waiting for? The first step is designing a deck that will accommodate the people, furniture and activities you’ve got in mind. If you need help thinking through specs or materials, please feel free to reach out to our team at Wahoo Decks any time. Our friendly representatives are happy to help walk you through the process, so connect with us online now.